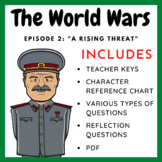 Video #2 questions of History Channel's "The World Wars" series. 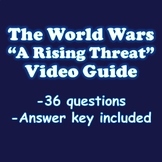 Rising Threat Video Guide History Channel Documentary "The World Wars"
The World Wars Part 2 A Rising Threat (Years Between The Wars) w. KEY! The History Channel created a compelling 3 episode series on the World Wars with a focus on the men that changed the world.